ROAD TOWN, Tortola, VI- Virgin Islands' World Junior silver medallist Kyron A. McMaster turned back the challenge of a top class field in winning the 400m Hurdles and achieving world number one status at the 2017 Jamaica Invitational on May 20, 2017. 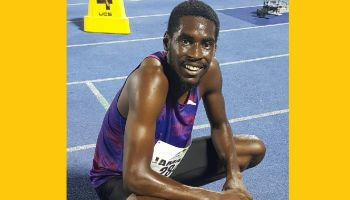 McMaster clocked a world leading time of 47.80 seconds to stun the field that included Olympians Bershawn Jackson, Javier Culson and Michael Tinsley and World Junior Champion Jaheel Hyde. 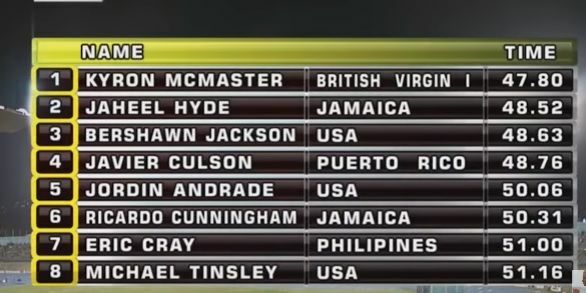 Hyde, who beat McMaster to take the gold at the World Junior Championships in Poland in July 2016 was second in 48:52 while Jackson was third in 48:63. The 20-year-old McMaster’s time, a new National Record, would have been good for bronze at the Rio Olympics. Congrats Mr. Macmaster, your family, coaches, and the entire BVI. A major achievement indeed. So good to see his registration number "284" (BVI area code) leading the pack of world class competitors. Was the registration number a deliberate choice? I am just curious. My heart is fill with Joy.. Beat up the Americans, Beat up the Jamaicans.. U know they are not happy. They preparing and coming for you... Mac. Just work on improving that time a little. They won't be able to atop you..Congrats. Much respect. Makes me proud. I am a Jamaican and I am very happy for Kyron. We do like to win but we value competition and hard work because it forces us to do better. It is Kyron's moment of glory so let us keep it positive. Not everybody bad mind!! I am jcan too and I am very happy for this young man and what his great performance means for the BVI. They told me it was it was by chance, not deliberate. I find that quite fascinating. Wow. Wow. Excellent. Stay with it. Work on it. Improve it..Thank for bringing us some good news. We need it ..
Woke up to good news. Take a page from Hosain Bolt book. Be very aware of the Americans, don't trust them, they hate losing.. They will talk and laugh with you and mess you up just like they did to Kirani James. Nice man. Stay forcus and positive. Wow! Kyron blew away that field! Very proud of him as 400m hurdles is the toughest out of the short distance races. BVI is proud 284 in the building. Let this be a motivation to all our youths that there is no substitute for hard work and commitment. Scary part is he is only 20? World championships next! I need to find out how i can assist to get this kid to the next level. Good Job, Kyron. We are proud of you. 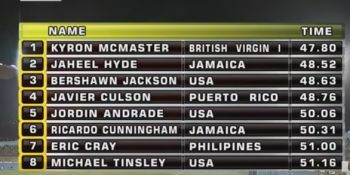 Amazing that the commentators first mentioned Mcmaster on the 100 m stretch when he was clearly in the top 2 for the entire race! They will remember his name now! 284 in the building! this young man is on his way to the Olympics. Congrats could only be fitting for this young man achievement. Hope that the powers to be really give him the support that he deserve to continue on the part of greater things at that level of competition. Congrats Kyron. You made us all proud-Residents and Citizens alike. Hope you will take home the Olympic gold. Let's put this in perspective. The 400 hurdles is not an easy race. He ran almost a full second faster than second place. It has been a while since anyone has dominated that race. The way he has been running consistently, and is now rated number one, speaks volumes. On top of it all, he is still learning the race and getting faster. .....I'm excited. where was his bvi flag? Both Kyron and his father are proud Virgin Islanders. His grandparents migrated to the BVI from Antigua in the 60s.